When does this frame happen? 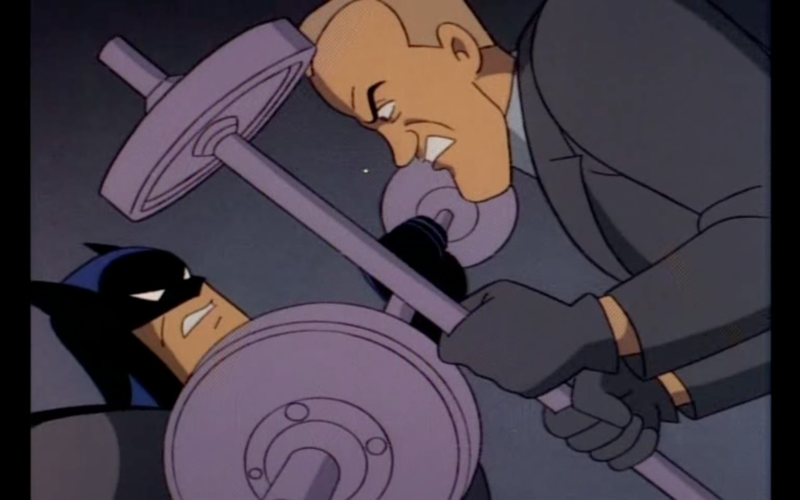 At the end of the episode, after Batman has dramatically revealed that he was disguised as a short fat Russian man, he and Wormwood fight through an office building into a gym room (with a pool) and use barbells as their weapons. Why are you sharing it? Barbell bars weigh 40lbs on their own, which is a lot of heft to throw around. 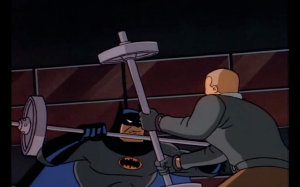 The weights on each of them probably weigh another 100, but even if they are just 10lb weights, it’s a bit much to be charge Batman with, or for Batman to pick up defensively. 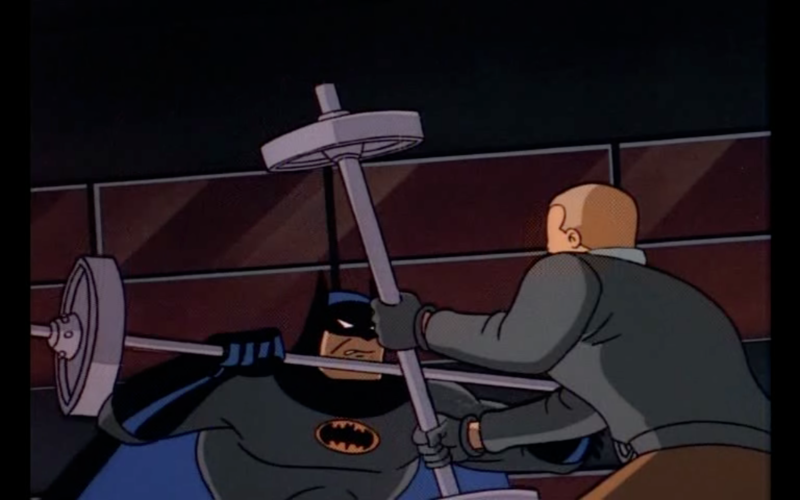 In the first frame, Batman would have to lift the weight of the bad guy + 40-140lbs off of himself just using his arm strength. And the guy he’s fighting isn’t even Bane! How is his opponent managing such a feat? It’s remarkable…y improbable. What makes this a foolish weapon choice for the cartooners to choose is that they are in an office building we’ve never seen before, with no explanation or reason for a gym, except for the conceit of having the key fall to the bottom of the pool. Wormwood is a thin man, and yet he and Batman seem to be equally matched in mental and physical combat for a long time until Batman regroups and owns him.